The Scout project is a proposed open source project under the Eclipse Technology Project. This proposal is in the Project Proposal Phase (as defined in the Eclipse Development Process) and is written to declare its intent and scope. We solicit additional participation and input from the Eclipse community. Please send all feedback to the Scout Eclipse Forum. Business application developers face many recurring requirements. Implementing these should not require a significant amount of time. Instead, developers should be able to concentrate on understanding and implementing business cases. 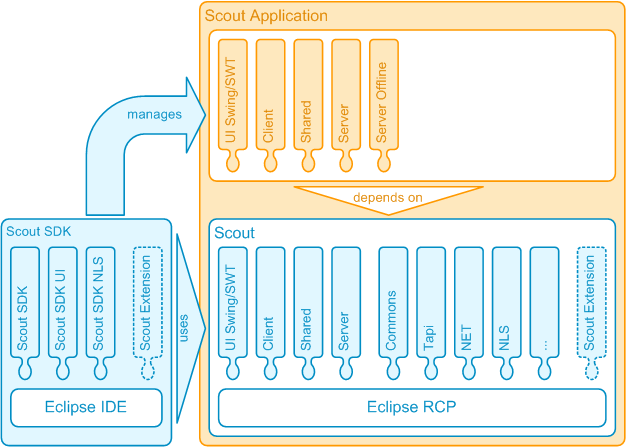 This proposal covers two main parts: Scout and Scout SDK, both are realized as fully compliant Eclipse plugin set. An overview of the application building process with the Scout framework is provided below. For more detailed information also see our Scout wiki. Scout application model supporting a clear and simple definition of business applications. Abstract UI component model including implementations for its Swing and SWT/JFace representations. Exchangeable client server communication. A reference implementation using the HTTP(S) protocol. Remote service infrastructure. Calls to services do not assume a specific location (client or server). Wizard support for managing the Scout application model. Real time synchronization of the application model and the generated Java application code. Tooling for providing/consuming web services, implementation of application services, and multi-language support. Build and launch support for Scout applications. Scout does not provide a persistence layer. The Scout data transfer objects (DTOs) represent the link to a percistence layer. Scout is not a GUI builder. The Scout client manages the mapping from the application model to a specific UI implementation depending on the UI plugin representation that is shipped with the application. Several concepts from Eclipse e4 are already integrated in the Scout framework such as a fully OSGi service oriented architecture (no singletons) and the usage of a UI independ application model (analog to the e4's IPresentationEngine concept). The Scout application model will become an extension of the e4 workbench model and include the UI component layer (e.g. SmartField, TextField, TableField, …). Based on e4 and Scout users may create complete and sound application models (EMF). Scout is the base of applications that may be developed with or without the Scout SDK. Scout applications are built on top of the Scout runtime layer. Maintenance of such applications and maintenance of the Scout runtime layer is only loosely coupled as illustrated in the diagram above. As Scout is written in pure Java/J2EE and satisfies the OSGi paradigm, integration of 3rd party libraries or applications is fully supported. The Scout runtime both provides a large amount of reusable functionality and a library of abstract UI component models. Architecture Sound and correct SOA architecture. Client- and server-side SOA. Communication Exchangeable communication layer with a HTTP(S) implementation. Services J2EE session safe service registries and the ability to remote a service. Service calls look equal on both client and server side. Internationalization Multi language support, number, date and currency formats. Components Approx. 35 main UI components cover most requirements of real live business applications. Both Swing and SWT/JFace representations are available. Session Context Enables J2EE backend session handling. Client Notification Inverse communication (from server to client). Extensions The ability to extend the framework in functionality and behaviour through the Eclipse extension mechanism. Application Model Wizard support to add/remove/modify the application model. Drag and drop support. Template Support Reuse enriched components. Create a template of forms. Internationalization Editor to browse, create, and edit multilingual application texts. Extensions The ability to extend Scout SDK to manage new components or add new SDK functionality on existing components. Build and Launch Support to export the application and launch both server and client in the context of the SDK. Scout applications are pure OSGi based Java/J2EE project. Therefore, any Eclipse project may be reused in Scout applications. Eclipse projects with a significant dependency to this proposal are listed below. PDE The Plug-in Development Environment provides tools to build Eclipse plug-ins, fragments, features, update sites and RCP products. Scout SDK strongly depends on PDE and uses functionality provided by PDE including the plugin model. JDT The Java Development Tools project provides the tool plug-ins that implement a Java IDE supporting the development of any Java application, including Eclipse plug-ins. Scout SDK strongly depends on JDT and uses functionality provided by JDT such as the type and compilation unit abstraction. Equinox The Equinox project represents a first class OSGi community and fosters the vision of Eclipse as a landscape of bundles. Scout applications are fully OSGi compliant. The Equinox implementation is used on both the client and the server side. BIRT Business Intelligence and Reporting Tools is an Eclipse-based reporting system for web applications. Scout SDK support for BIRT is scheduled. Currently, BIRT functionality may be integrated in Scout applications without Scout SDK tooling support. Riena The Riena platform provides a foundation for building multi-tier enterprise client/server applications. Riena and Scout have evaluated their impact to each other. A friendly co-existence is intended and a common interest in the development of components useful to both projects has been identified. ECF Eclipse Communication Framework. Supports the development of distributed Eclipse-based tools and applications. The Scout project evaluates the ECF project to use as a communication framework. RAP Rich Ajax Platform. The RAP project enables developers to build rich, Ajax-enabled Web applications. Scout SDK RAP support is scheduled. Currently, a demo Scout application that uses RAP is available. Swordfish Swordfish provides an extensible SOA framework based on the proven Eclipse Equinox runtime technology. The Scout project is evaluating Swordfish to orchestrate business process on the BEPL standard. EclipseLink The Eclipse Persistence Services Project (EclipseLink) provides a complete persistence framework that is both comprehensive and universal Scout project is evaluating to integrate EclipseLink as a standard persistence layer. Today EclipseLink and others are and can be used as a persistence layer. Currently, Scout SDK provides no tooling for the persistence layer. EMF The Eclipse Modeling Framework project supports modeling and code generation for building tools and other applications based on a structured data model. Starting with e4, the Scout application model will become an extension of the e4 workbench model. Apart from dependencies to existing Eclipse plugins, the initial code contribution from BSI AG relies on the availability of the following libraries. As part of the code contribution review, BSI AG will also submit these for approval per the Eclipse development process. Functionality described in this proposal will be provided by BSI AG. The Community is asked for input on the existing code base, feature requests for new functionality, and bug requests.